Many people think that exercise during pregnancy is dangerous and that women should put their feet up and rest as much as possible. This may sound appealing (at least for a couple of days) but generally exercise during pregnancy, as long as it is done sensibly, is beneficial to both the mother and the baby. We’re not talking about running the marathon (unless you’re Paula Radcliffe). Exercise during pregnancy should be ‘recreational’, aiming to stay fit rather than reach peak fitness. There are many benefits to exercising in pregnancy. It can reduce many of the common complaints that occur during pregnancy such as fatigue, swelling, insomnia, stress, anxiety and depression. It can reduce problems such as weight gain, cardiovascular problems, gestational diabetes and pre-eclampsia. It also reduces the risk of developing colon cancer and may reduce the risk of breast cancer later in life. There have been studies that show that women who exercise in pregnancy may tolerate labour better, that it can reduce the length of labour and the amount of complications. It is also worth mentioning that you can exercise if you are breast feeding. It doesn’t affect the amount or quality of your milk and most women can exercise as soon after delivery as they feel ready. However, it is important to balance the benefits and the risks. During pregnancy, your body changes. Your joints become lax and hyper-mobile (you become much more stretchy). Your metabolic rate increases meaning your body temperature can increase. And obviously you are carrying a large bump on your front, albeit a very precious large bump. • Make sure you don’t get too hot by drinking lots of water, don’t over-exert yourself and avoid exercising in very hot and humid climates. • Avoid low blood sugar by eating well during pregnancy and don’t exercise for more than 45 minutes at a time. • Avoid low blood pressure by not doing exercises that involve lying on your back, especially after 16 weeks. • Avoid physical injury by doing warm up and cool down exercises and consider wearing a pelvic support belt (because of the loose joints). Choose activities with minimal risk of losing balance or being hit in the abdomen such as judo or squash. • If you have any unusual symptoms (such as pain or shortness of breath) you should stop exercising and contact your healthcare professional immediately. • If you have a medical condition you should discuss with your healthcare professional before doing recreational exercise. If you didn’t exercise before pregnancy, you should start with no more than 15 minutes 3 times a week and gradually build up. 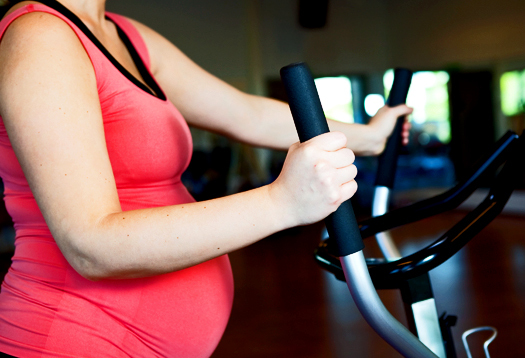 If you did exercise before pregnancy, you should be able to continue provided that you take the above precautions. There are many fantastic classes that are designed especially for pregnant ladies, such as aqua aerobics and pregnancy yoga. They should help you find an exercise routine that you are comfortable with. If you have any concerns, it is prudent to talk to your midwife or doctor before doing any exercise. ← JoJo Opens in Guernsey! Just to add- I did cricket practice including bowling machine practice until I was 7 months pregnant. – I carried on playing badminton with my club right up until the week before my waters broke. I did bodycombat and spinning classes + swimming twice a week -I did a double bodycombat and bodybalance class one day before my waters broke- my instructor told me never ever to that to him again!. Yes these were non-contact sports but I carried doing these sports as I had always done them before for many years. I never knew why I never saw another pregnant woman in any of my classes and never any since then – such a shame as I loved doing them during pregnancy and felt very good afterwards. I totally believe it helped in everyway possible and now my little girl loves yoga and running- lots..gulp. Just because you are pregnant does not mean you have to give-up everything you did before. As long as baby was OK and I felt good I carried on. The only thing I had to give up was saunas and steam rooms. So please carry on your classes- let your instructor know as soon as possible (I told mine before my family! at 6 weeks)- they will give you alternative exercises to do when necessary- usually after first trimester you have to do ab exercises slightly differently, tell you to take breaks as often as you need, to keep cool (so situate yourself near air con/doors etc)and to make sure you hydrate a lot. But other than that get out an exercise with your bump. And walk walk walk everywhere. Enjoy. Jeanette – your pregnancy exercise regime puts mine to shame and I’m not even expecting! That’s great advice, and the fact your active lifestyle has had a positive effect on your daughter makes it all the more worthwhile.